What is it? 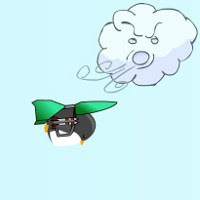 – Learn to Fly is an appealing round-based game where you help a determined penguin overcome his aviational shortcomings. Who made it? – The game was developed by Light Bringer. How does it play? – Fresh from an internet search informing him that penguins are “flightless birds,” the dogged protagonist sets out to prove the world wrong by hurling himself down icy slopes and launching into the wild blue yonder. There are 5 progressively taller (unlockable) slopes. Money is earned based on your distance, height, and flight duration, and it can be spent on upgrades between rounds. Sub-objectives (like achieving a certain height or distance) will also earn you extra cash. Ramp height, acceleration, and wind resistance can all be upgraded, and you can even purchase various gliders and rockets to propel your bird even further. Presentation – The fat little penguin is a truly charming hero. The graphics are very simple overall, but mostly get the job done. Positives – Like other games of its type, Learn to Fly is an addictive experience. You’re often just an attempt away from your next upgrade, and it’s satisfying to watch your performance gradually improve. Negatives – The beginning and end of the game can be frustrating. Your initial attempts to fly will really just be cash gathering efforts, as you’ll plunge off the slope and land in the sea almost immediately. This hurdle doesn’t last very long, but may turn some players off. The final achievements on the last level can seem supremely difficult to reach. They’re possible, but they’re a lot tougher than the bulk of the game. You’ll probably max out your upgrades (making cash obsolete) long before you beat the game. Why you should play it – Learn to Fly is another great example of a game that successfully induces “just one more round” syndrome. While maybe not quite as good as similar offerings like Hedgehog Launch or Shopping Cart Hero, it’s still a fun game. Besides, penguins are awesome.